In the beginning there was analog television and we were so thrilled to have moving pictures and sound in the home, quality was irrelevant. Color was introduced and the awe continued. 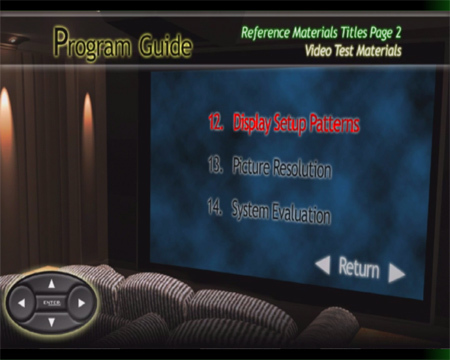 Broadcast standards emerged for contrast, brightness and eventually color, but in the end the individual TV set makers would always have to adjust for the capabilities of their newest analog displays and manufacturing design standards. Time passed and computer displays came about. They had to map the analog capabilities of CRT analog displays to the digital steps in levels that computers were capable of specifying. TV's NTSC standards stayed very much the same, but capabilities of displays designed for computers improved. In the case of computer monitors and high-end home theater projectors these capabilities grew very quickly over the years. Then LCD digital PC monitors, projectors and digital Television displays came on the market and ... well... things are changing way to fast to explain the rapid changes over the recent years. One thing that does not change though is that calibrating your display system from source to display is crucial. If you want to get your moneys worth out of these more expensive, higher resolution displays, designed to deliver High Definition programming, it is worth the time and expense... No doubt whatsoever. People not only don't think about calibrating their HDTV's (Doh! Don't they do that at the factory!) , they have probably never heard of "Avia" or "Digital Video Essentials"- the two most widely used DVD's for calibrating a home theater video display system. 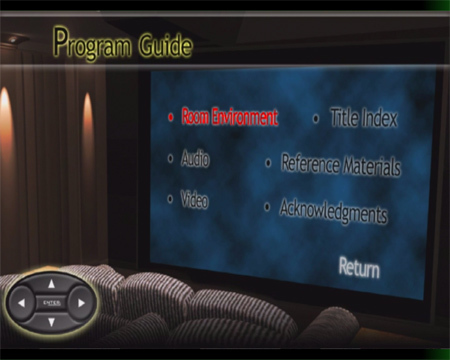 Using either Avia or Digital Video Essentials can be an interesting experience just learning the DVD menus. Both disks are a good deal more difficult to use than navigating your average DVD, but give detailed instructions on the proper usage. Either disk should be watched by most people all the way through the first time in order to absorb the information on them. This site is designed to give you pre-exposure to the procedures on the disc and will increase your understanding and watching experience. They both have a wealth of information and we recommend adding both to your library for periodic recalibration as the display ages. NOTE: The images presented here in this tutorial are not meant to be used to calibrate your display. They have been altered so that Computer users can hopefully see the mentioned attributes of the test screens. You will need to buy either or both disks to see any of these test signals properly presented for you to use for your display. 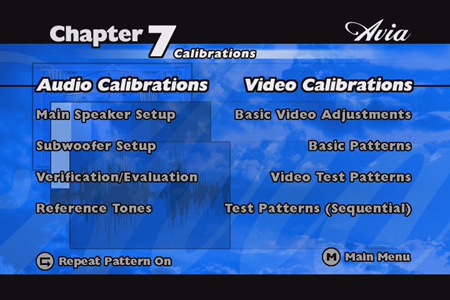 Another Note: You can do pretty much everything with Avia that you can with DVE, both have certain strengths and few weaknesses, and both will give you an excellent video calibration when done correctly. Just about every feature of either of these disks is available in some format in the other disk, although both do have various strengths and few weaknesses. Avia is a great disk, with very good information and calibration examples, explanations of calibrations as well as excellent test signals to be used for calibration. It is arguably easier to get a good 5-minute calibration with Avia than anything else. *You can spend a lot more time than that, there is much, much more material than mentioned here. .. Here's how to calibrate your display very quickly with Avia. 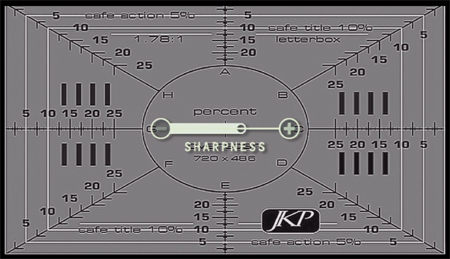 First adjust all "sharpness"" settings on TV and DVD player to "off" or the lowest level. Set your video display and DVD player settings to "Pro", "Normal" "Advanced" or whatever setting you might think, or have heard will set your display near to the "6500K" standard. Contact your vendor if necessary. If you are not sure which is correct - guess. "Vivid" or other very bright settings are the opposite of what you want. If you are new to this look for the most boring setting that sounds right. 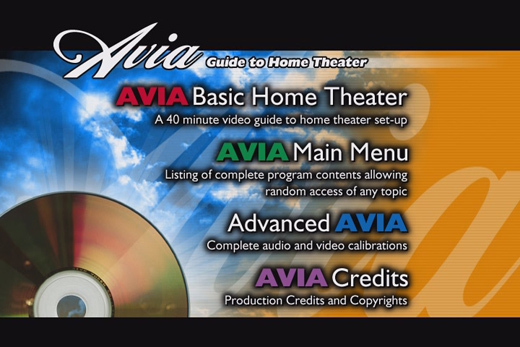 Next insert the Avia DVD and sit through the title if you have to and then click next whenever it lets you. Select "Gray Scale and Levels". Set up display to adjust White Level (Contrast or Picture). 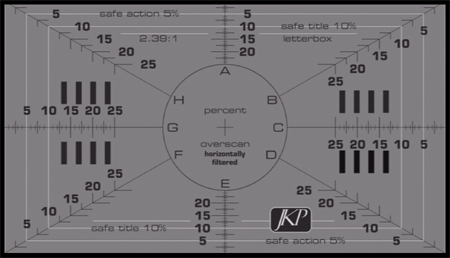 White Level (Contrast or Picture) adjustment screen. 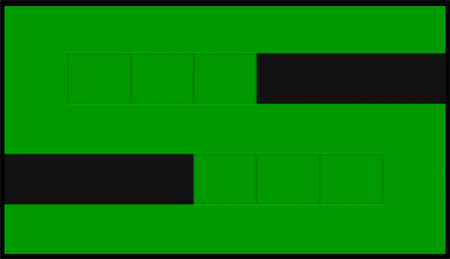 Adjust your white level until the right hand side bar of the two moving white bars becomes invisible. Then bring down the setting until the right hand side bar becomes just slghtly visible. Click the next chapter button or let it play until it gets to the Black level adjustment. 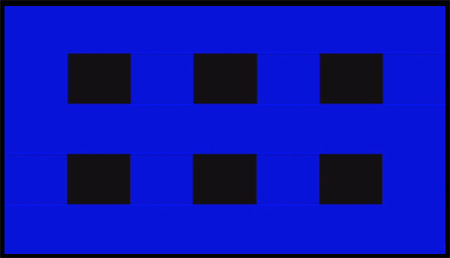 Adjust the left side moving bar on the left side until the left side bar just blends in with the black around it, and no further. You will have to go back and forth with the Black level and White level adjustments to get them both just right. 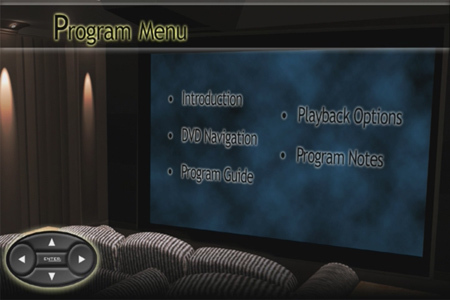 Use previous and next menu controls on your DVD remote for navigation. OK, black and white levels done it is time to adjust color. Click next chapter button until you get to the Saturation (Color, Chroma) Hue (Tint) screen. Pause the video! Now you have to use the blue filter provided and adust both the the Saturation (Color, Chroma) Hue (Tint) at the same time. Hold the blue filter across both eyes. Unpause the video. First adjust the Color, the outside two bars to as closely as possible match the background. One way to think about it is they should stop flashing. Now adjust the Tint in the exact same way. This is a very intuitive adjustment, which is one of the strengths of the Avia color adjustment. 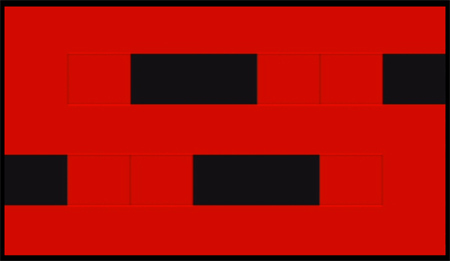 Switch back and forth from color to tint until flashing is at a minimum on all of the squares. 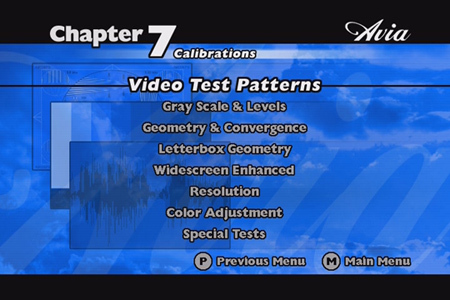 Go to Video Calibrations/ Video Test patterns/Gray Scale and Levels/gray Steps and Ramps/Crossed Step Scale. 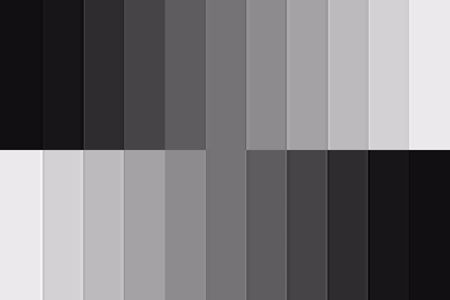 There should be 11 steps of gray, from black to white. Count them. Pause the DVD. Make sure Contrast is not set too high or your upper white/grays will blend together and become the same. Also notice that adjusting your Brightness effects this. 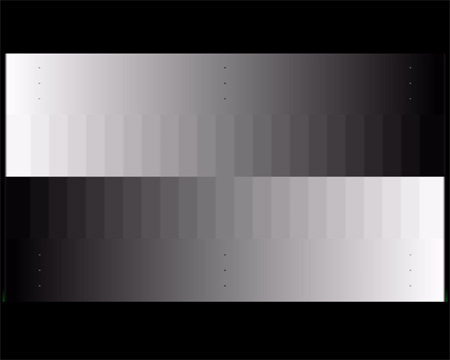 Contrast (white level) is a crucial setting that determines the difference between light and dark images. The goal is to have a high contrast ratio. The problem is, if set too high, your higher brightness levels will all be white and all dark levels will all be black. Contrast especially can cause color shifts which are more apparant on the white end of the scale. Your higher white levels may take on a bit of color, which is Not good, so you need to adjust contrast for maximum dynamic range of your image without "white crush" (whites too white) , "loss of shadow detail" (blacks too black) or any color shifting. Display the reverse gray scale steps. Set brightness to the standard setting. Adjust contrast to reasonable maximum, higher than normally where you think it should be. Those with CRT's should avoid blooming, etc. Adjust brightness until last black bar is just different from next one. If not possible, turn down contrast a bit and try again. Adjust contrast until all white steps are just visible. Bring down Brightness until the last black bar is as black as possible, yet still different from the step next to it, again! Do over as many times as is satisfying. Also look at gray ramps, they should be as smooth as possible with no color shifting - just shades of gray. Color shifting could be due to the contrast being set too high or problems with your color/tint settings. The beginning wonderful montage of images which begin the Digital Video Essentials disk actually have a lot of very good display testing material and once again you really want to watch and listen to everything on the disk. This disk is probably stronger in updated content than Avia. It also has some adjustment tests with signals that Avia just does not have. It does seem a bit more complicated in use. Anyway, when you finally can get to the main Program menu, choose "Program Guide". Ok, here's the "Program Guide menu". Use the arrow button to get to the next screen, which has the video patterns. Select the "Display Setup Patterns" Chapter 12 option. Here you get to the "Black Level" setting. This is one area that Many would argue the Digital Video Essentials has an advantage over the Avia disk. 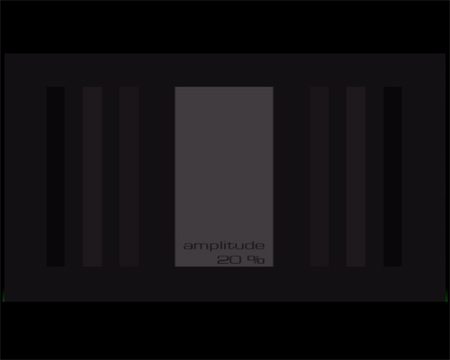 The DVE disk has test patterns that include "Blacker than Black" material and is an excellent way to set your black level no matter what type of display you may have. 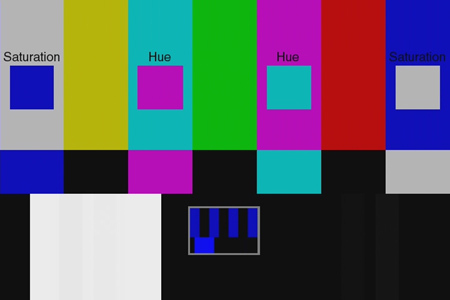 The third bar on the outsides of both left and right sets of three vertical "gray" level bars inside the white "I-beam" is supposed to be invisible at "Studio" video levels. On a Computer, video levels are normally set differently which might explain why you may see them on your display now. 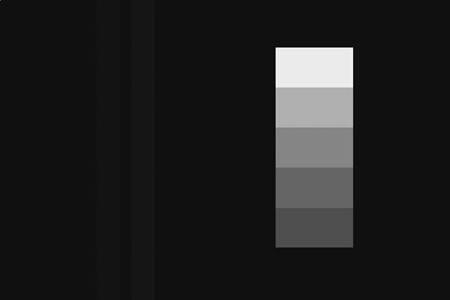 Depending on how your computer display is set up, you may see the three bars, two bars or maybe even one bar as a lighter shade of gray than the "black" background. You may want to temporarily set the contrast and brightness of your monitor until you can see them, just to see what we are talking about. Here's another example with contrast raised. Do you still see all the bars? Next check again , stepping through the different test signals with different levels of white in the center to be sure overall brightness levels do not effect the balck level. If they do, try to find a setting that keeps blacker than black always invisible with a digital display, and maybe fudge a little with a CRT analog display if need be. Next test out your black and white levels. 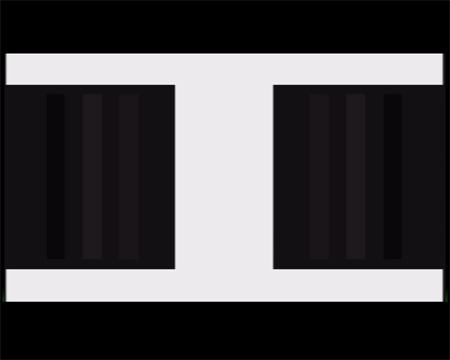 The Best Steps and ramps pattern for white/black levels? Digital Video Essentilas has a great combined gray scale steps and ramps test pattern. Make sure the steps are all visible, and the ramps are smooth, with no color abnormalities. Digital Video Essentials is a bit trickier to do color adjustments on, but can be a bit more exacting when you do get it right. You still use the blue filter for the intial color and tint settings. The idea being to get the color slices to even settings. You should try to hold the filter close enough to cover the entire screen. This will give you a much better idea of the color uniformity. After using the blue filter you should try using the green and red filters to test and if possible, adjust the red and green gains for proper levels. 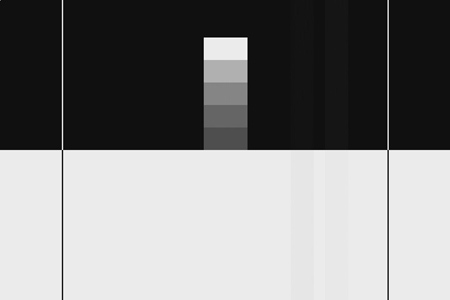 This displays how much of the sides and tops of the image you are losing due to the "overscan" of your display. TV's have "overscan" built-in in order to not take up any extra screen "real estate" with black bars on the sides and/or top. 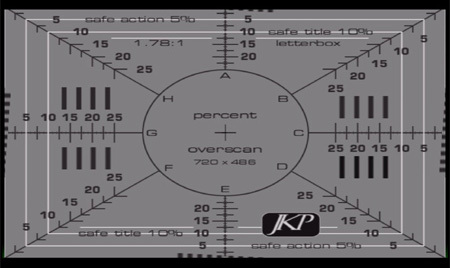 For viewing test patterns at least, the lowest possible sharpness setting you can get on all of your equipment is usually the best. Sharpness generally adds edge enhancement and noise which can in the end diminish the 3D effect and overall quality of a properly calibrated video system. Use it to taste, but try to see if you can live without it for awhile and see if you don't find the overall image better without it. DVE is excellent at showing how sometimes "blurry" is better. 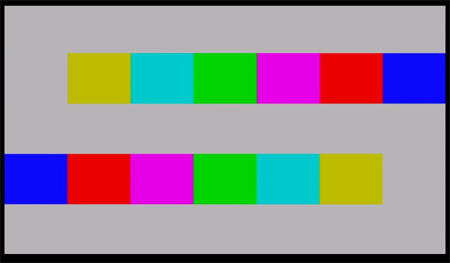 While lack of sharpening may appear blurry or less well defined, a good look at the test patterns show when sharpness is adding noticeable alteration of the signal. There are many sources for more information on this subject.